REMEMBER TO WEAR HEAD PROTECTION. One player (# 9) on the right-hand side of the field. Another player on the left hand side. These two players are positioned on the 2-meter line. The remaining players are waiting in the middle of the field. Every player has one ball except for the player on the right side (# 9). 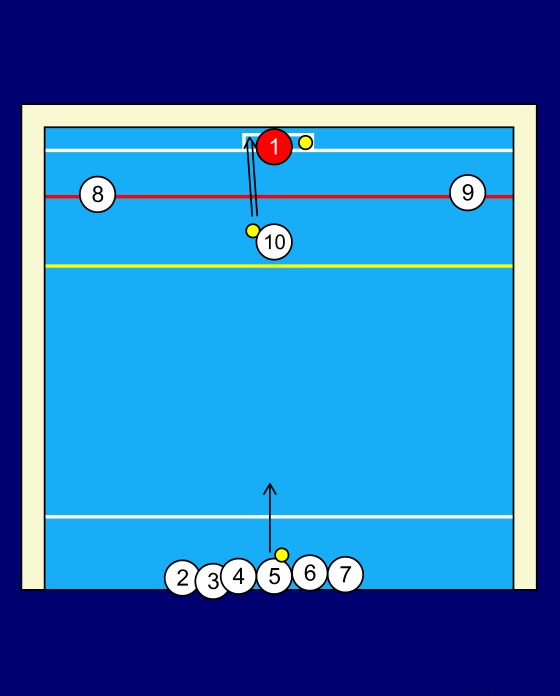 The remaining balls are put behind the player on the left side (# 8). At first # 10 passes the ball to # 9 and swims to the 7-meter line (green one). Then # 9 passes the ball to # 10 (who now is waiting on the 7-meter line). He/she catches the ball en shoots at the goal. The next step is, # 10 swims up to the 4-meter line. He catches the ball passed to him/her from #8 and shoots this also at the goal. The next player starts here with the excercise to keep up the pace. Then # 10 fetches one ball and swims with it to # 8. Leaves the ball and swims back to the middle line where he/she joins up with the rest waiting. You can use this excercise with or without the goal keeper. And with a little invention your self you can change this excercise.